I finally got around to getting the engine out of the frame. It is nasty and dirty. As i started to take the heads off, i started noticing some surprises. The park plugs are brand new. I popped off the valve cover and it looked like brand new valves and springs. unfortunately, this bike has been sitting for at least 15 years with no oil and some rust has accumulated on the springs. At this point, i wanted to seek the expert advice of my engine mechanic. I know all the parts of the engine, but i can’t put one together… nor can i take one completely apart. 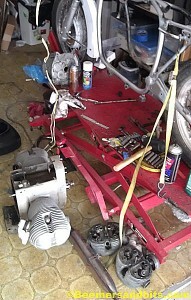 I want to go entirely through this bike and make it brand new again… and that includes every piece of the engine. And it was a good thing i did. 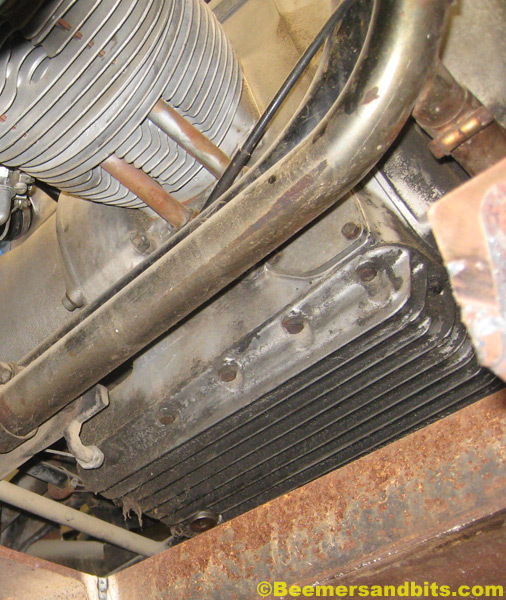 I should have noticed the pushrod tubes were new but maybe the rust threw me off. 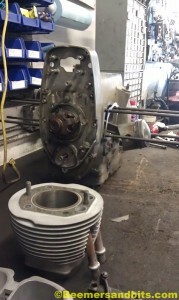 Engine out of the frame ready for a tear down. As it turns out, somebody started to rebuild the engine. But they did it in a half assed way. 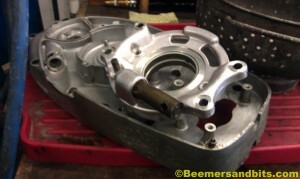 One side has brand new valve job with new BMW valves. the other side has the original valves, just cleaned up. Clean pistons too but who the hell knows what the spec might be on them. they aren’t new BMW so maybe they were bored out? is it worth the gamble? i’d say not. 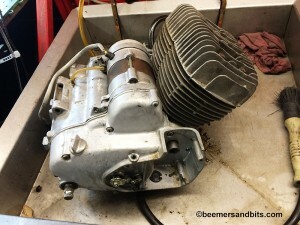 The Siebenrock piston and cylinder kit is a much safer bet and upgrade. I’d rather run Nicasil cylinders to be compatible with today’s gas vs cylinders meant for the gas of the 70s. The question is what to do with the heads. 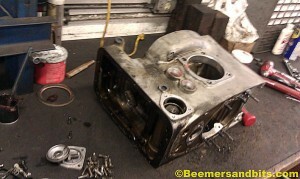 One may be OK, provided it has factory BMW valves and not aftermarket. The other is definitely in need of new valves to match. Do they both get new Black Diamond valves or do we replace just the one side with BMW valves? Either way, they will come completely apart and be reassembled. Good thing we went this deep into the engine. 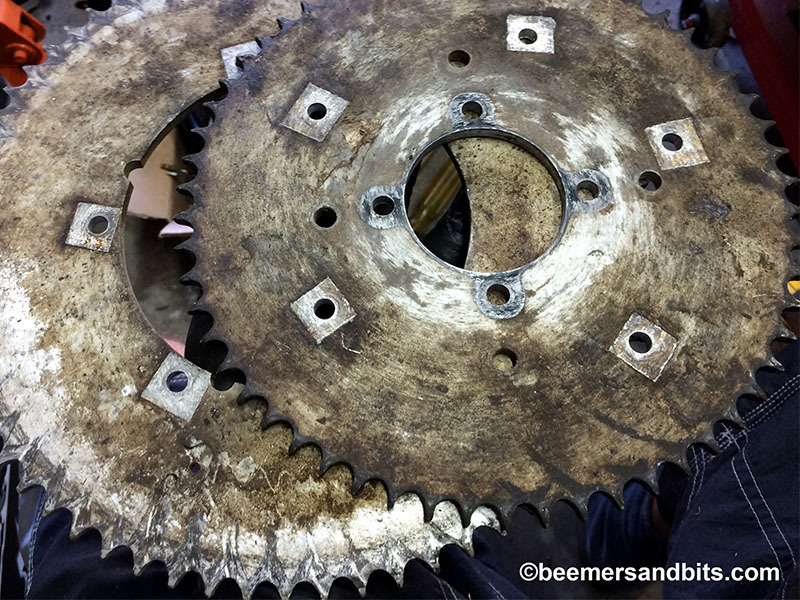 the timing sprocket and chain had a TON of slack in it. 2 of the cam followers were pretty beat too. 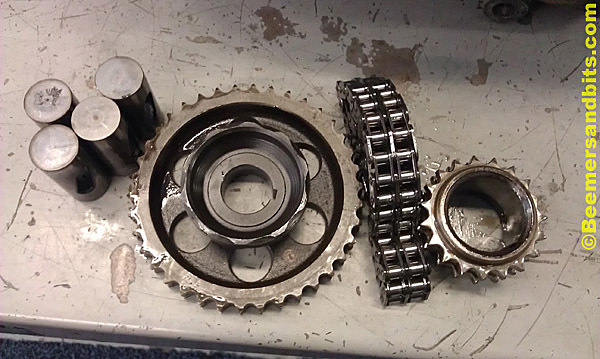 I can’t understand somebody doing a new head job, boring out pistons and then putting it on an engine with such a slacked out timing chain. Parts for the trash man. 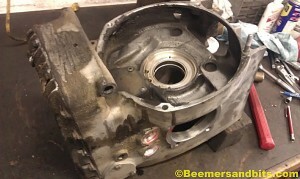 You should have seen all the sludge caked onto the inside and outside of the oil pan. 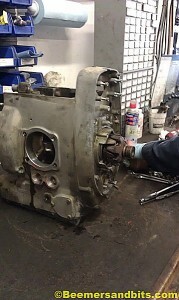 Again, i can’t believe somebody put the engine back together and was going to run it with all the sludge in there. I literally had to scrape all the old oil out of the oil pan. it was like somebody poured syrup in there and let it solidify a bit. i should have snapped a photo for the ‘wall of shame’ but i went straight to cleaning everything up. I now have all these parts boxed up. The plan is to clean and polish the exterior parts and spray it with a thermal dispersion clear coat to help dissipate the heat from the engine. I’ll keep the stock cam shaft. I’ll have to do some research on Black Diamond valves vs BMW valves. Since we already have 2 BMW valves, we may go the cheap route and do the other two to match vs a new set of 4. 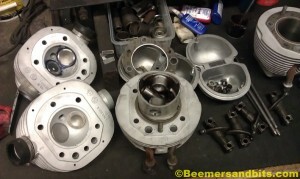 Siebenrock kit will solve any piston and cylinder concerns. 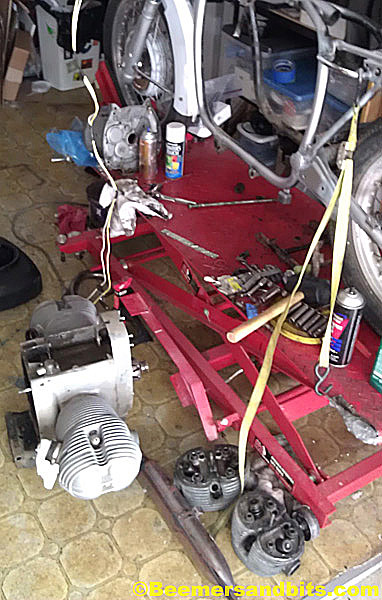 That kit works with the (recommends) stainless steel pushrod tubes and later seals. Carnage. 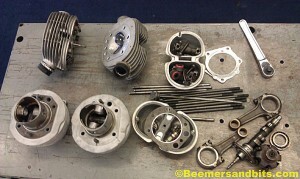 All the guts of a 1972 R75/5 BMW engine. Lastly is the rockers. I have never seen rockers on a bike earlier then 1977. The engines on my two other bikes are from 77 and 79. It turns out that until 1973, the /5 rockers were the brass bushing type. In 1974, they switched to a needle bearing. I’ll probably want to upgrade them somehow but i’ll have to figure out what parts work with the /5 heads. 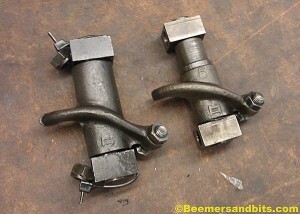 Rocker arms. 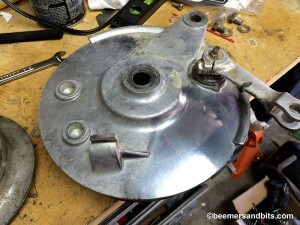 /6 Needle bearing type on left. /5 Brass bushing type on the right.